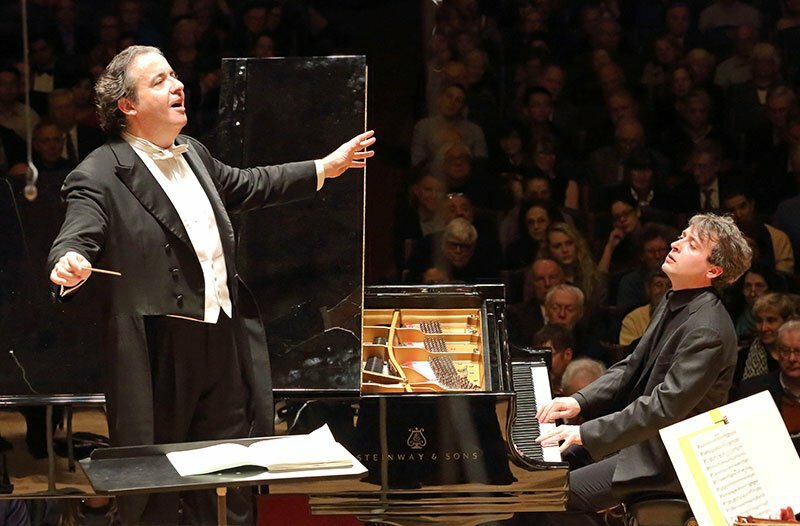 Since for many of us this past week has been fraught with free-floating anxiety and despair, the week’s Boston Symphony concert (I attended Friday afternoon) proved the perfect tonic: a sonic sanctuary. Juanjo Mena, who replaced, on short notice, the indisposed Christoph von Dohnányi, opened with the American premiere of Julian Anderson’s Incantesimi, which featured BSO’s superb English horn player, Robert Sheena. A co-commission by the Boston Symphony, the Berliner Philharmoniker Foundation, and the Royal Society of London, Incantesimi bursts with color, alternately growling and shimmering, with three percussionists performing on, among other things, tubular bells, a large tam-tam, bass tom-tom, a mokubio (miniature woodblock), hyoshigi (kabuki clappers). Under ordinary circumstances, I wouldn’t mention that these performances are partially supported from the invaluable National Endowment for the Arts, but these are, alas, not ordinary times, and it’s unimaginable to think of how impoverished the arts—and we humans—would be if such necessary largess is soon eliminated. All this said, it’s a fun, imaginative piece that merits another hearing. The upper strings sounded angelic, the lower strings menacing. But it was Sheena’s exquisite playing that made this performance so very memorable. Jean-Frédéric Neuburger was the intriguing soloist in Robert Schumann’s beloved Piano Concerto in A Minor, Op. 54. (first performed by the BSO in 1882 at the start of its second season) with, the program tells us, “Mr. Georg Henschel, conductor, and Professor Carl Baermann on a Chickering Piano.” This is such a popular, frequently recorded concerto, that it was interesting to see what Neuburger would bring. It turns out, he quickly banished other famous soloists from my mind. He has a beautiful touch, and a large range of dynamics, the requisite power, delicacy and freedom to make his interpretation persuasive and memorable. The winds were standouts, and Mena presided with élan. Most impressive. Neuburger got—and deserved—a standing ovation; he rewarded us with a captivating encore, the Capriccio from Bach’s Partita #2 in C Minor, BWV 826, played extremely with an extraordinary use of color to delineate voices and rhythmically decisive, dramatic flair. I am very glad to have heard Juanjo Mena and Jean-Frédéric Neuburger. This concert was a blessing: an oasis of ravishing beauty in a time of chaos. Just out of the Saturday concert. It was spectacular. The Anderson was spellbinding. Neuberger played with an understanding that Schumann was a revolutionary and a force of Nature. The Schubert was outstanding, a revelation. I’ve never heard the BSO produce such sound. Juanjo Mena is a genius. We need him back again. I could not agree more with Leon Golub, we need to see a LOT more of Juanjo Mena. His previous week’s concert (Prokofiev/Weinberg/Tchaikovsky) was also excellent. And there’s a recorded performance on YouTube of him conducting his own BBC orchestra at the Proms a few years back performing Bruckner’s wonderful 6th symphony, a first-rate performance that is well worth anyone’s time to watch. Two thoughts occurred to me during the Thursday performance. Mena could be a worthy successor to Frühbeck de Burgos as a guest conductor for the BSO. Maestro Mena was keeping the Schubert sempre leggiero — it never became ponderous or tedious, which has been a problem with some performances I have heard. The Schumann also was satisfying throughout except when the piano was drowned out by the orchestra, at least toward the rear of the first balcony left. “Incantesimi” should be scheduled for another Symphony Hall performance as soon as possible — not that it’s the greatest thing since sliced bread, but it would be good to hear it again for fuller appreciation. I think Anderson gave us a piece of real music.